I received a couple of paid signings back today, both from Tom Orr at Atommic Sports, who did a great job as always. 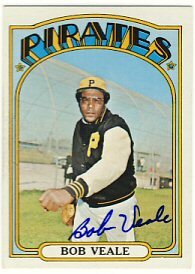 First, I was able to get Bob Veale sign his 1965 and 1972 Topps. Mr. Veale doesn't sign through the mail so I didn't want to pass up this opportunity. 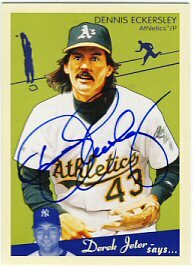 Next, Dennis Eckersley signed his 1976 Topps rookie card as well as a 2008 Goudey. 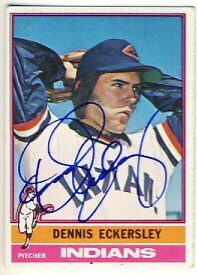 I was surprised that I didn't have any Eckersely autographs in my collection prior to this signing. 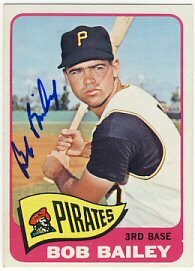 I should also get a ball signed. 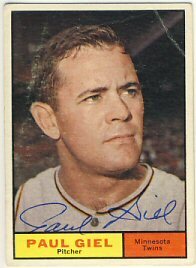 Tomorrow I'll send out a couple more 1963 Western Oil Twins portraits. 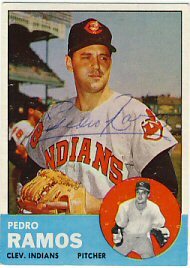 This time to Jim Perry and Camilo Pascual. It's been really slow but I was happy to find a return in the mailbox today. 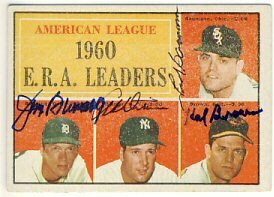 Hal Brown completed a 1961 Topps card highlighting the 1960 American League ERA leaders including Frank Baumann, Jim Bunning and Art Ditmar. The card took a bit of a beating in the mail to all four players, but I'm happy to have it done. Returns two days in a row! That hasn't happened for a while. 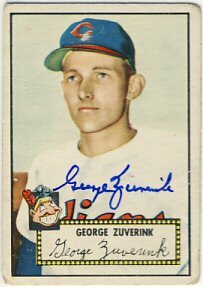 George Zuverink signed his 1952 and 1956 Topps for me. I won't be sending out any more requests for a while, so it could be pretty slow. 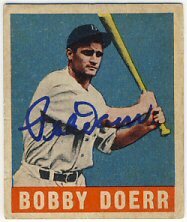 I received a really great return today: Bobby Doerr signed his 1948 Leaf for me in about 10 days. I had enclosed $5 cash with my request. 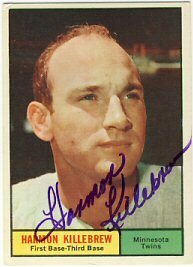 I really love getting these vintage cards signed but it's getting harder and harder to do! 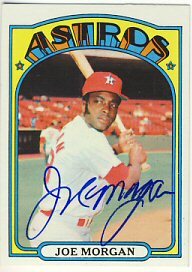 Yesterday I received three cards signed by Joe Morgan that I sent in to yet another Tom Orr (Atommic Sports) signing. 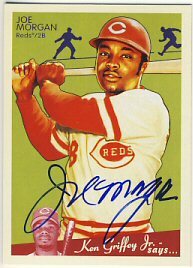 I needed Morgan for three of my sets including 1965 Topps, 1972 Topps and 2008 Goudey. I went ahead and ordered TwinsFest tickets for my older son and I for all three days. My younger son isn't going to go this year so my wife lucks out and gets to stay home for the first time since 2007. Yesterday I received one return. 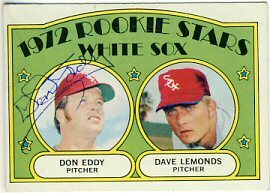 Dave Lemonds signed a 1972 Topps already signed by Don Eddy. I haven't written much about the Twins for a long time as there really hasn't been much to write about. They've traded fan favorites Denard Span and now Ben Revere. 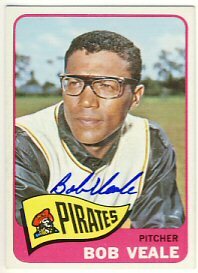 Scott Baker has left, they got rid of Liriano late last year and there continues to be talk that Morneau or Willingham could also be traded. I don't think we've gotten much in return, especially any pitching that will help us much in 2013. Maybe I'm wrong about Worley, but he's only had one good year in the majors, and that wasn't last season. TwinsFest is looking like a bust unless they come up with some former players. I'd love to get some more players form the 1991 team to sign their bobbleheads. As it stands, lines for Mauer and Morneau will be crazy, but the wristbands will help. Willingham's line will be huge, and then there will be "everybody else." This may be my first year in a long time that I'm not there all day, every day. Today I received a return I wasn't really expecting. 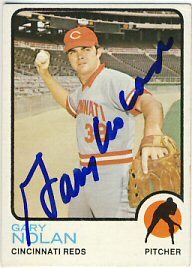 Gary Nolan signed a 1972, 1973 and 1978 Topps for me that I sent him about 20 months ago. 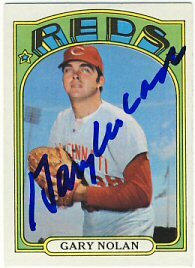 I had already purchased a 1972 Topps signed by Mr. Nolan from Mickey's because I hadn't seen a return from him posted on SCN for quite a while. 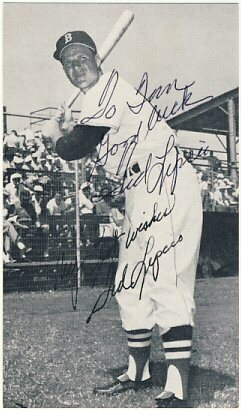 My first return of the 1963 Western Oil Nicholas Volpe portraits arrived today. 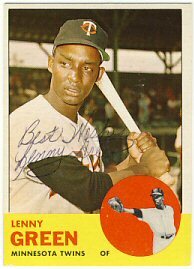 Lenny Green signed it very nicely with the silver sharpie that I enclosed. I think the silver sharpie looks good. Now I just need buy some more large envelopes to send the other 11 out. 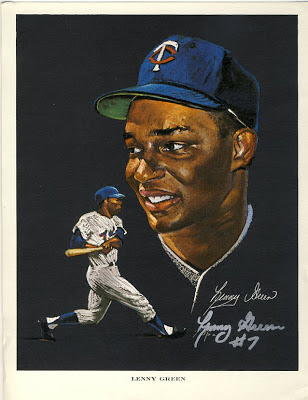 Today my son and I headed over to the Twin Cities Sports Collectors Club show in Bloomington. 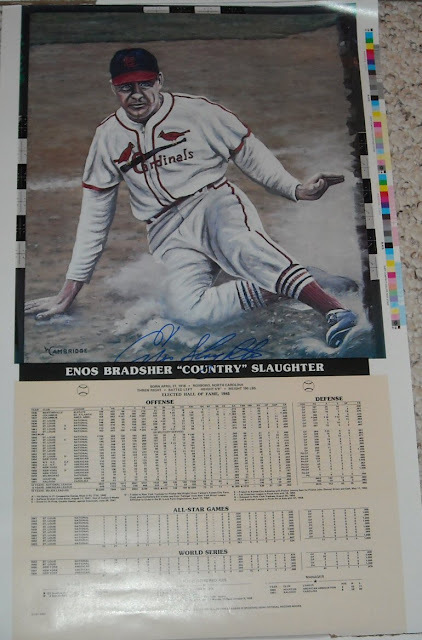 Every few months they have an auction and I've made some nice purchases there in the past. 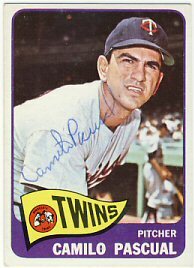 Today was another auction and I didn't see much on the tables prior to the start except for a few pages of older Twins autographs. We stayed about 50 minutes into the auction until this item came up for bid, and I was lucky enough to win it. There were a total of 14 signed cards and 4 signed photos/postcards. 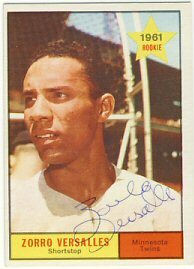 The card that really caught my attention was a 1961 Topps signed by Zoilo Versalles. 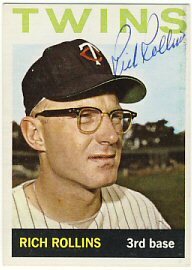 Mr. Versalles passed away in 1995. 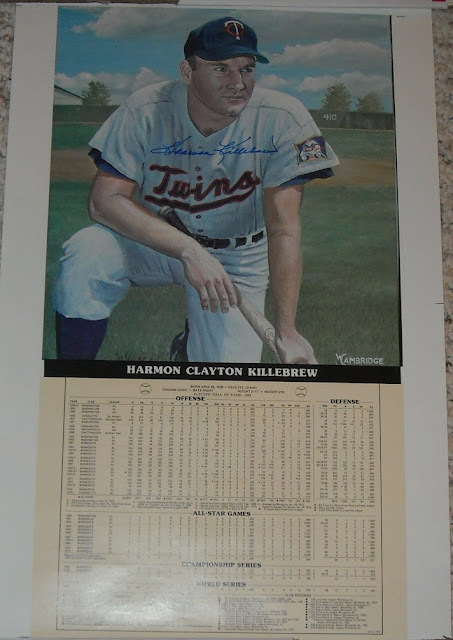 There is also a 1961 Topps signed by Harmon Killebrew, a 1964 Topps signed by Earl Battey, and a small picture signed by Bob Allison. 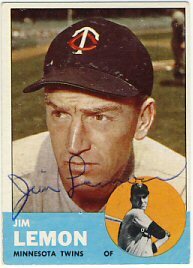 Many of the other players are also deceased including Paul Giel, Don Mincher, Jim Lemon and Lamar "Jake" Jacobs. 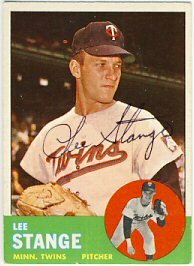 I also bought a handful of cards to send out including a 1952 Topps, and a few 1956 Topps. I've been thinking about getting some of the 1963 Western Oil portraits signed, but with their black backgrounds, I thought it might be a tough project. 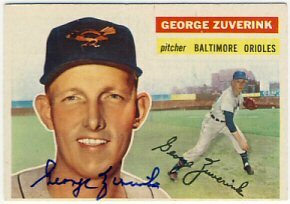 But I came across 12 different portraits on Ebay of good through the mail signers so I bought them all and plan on sending them out shortly. I sent one out already as a test to see how it looks with a silver sharpie I enclosed with my request before I send out the rest. 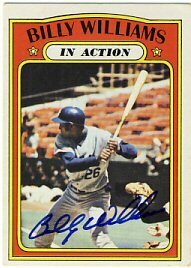 Today I received a 1972 Topps In Action signed by Billy Williams. I had sent it in to Tom Orr at Atommic Sports who did a great job as always. 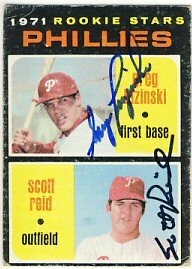 A while ago I posted about my ttm success with Greg Luzinski, who signed his 1971 Topps for me. Today I received a return from Scott Reid who finished the card for me. 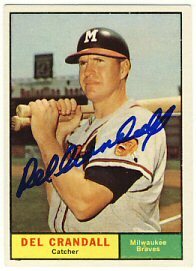 I also received a 1961 Topps signed by Del Crandall. I enclosed $5 with my request. I'm not sure why it took me so long to send this card to him since I've been working on this set for a long time. I bought a couple of signed pictures from a fellow SCN member. I've seen a few of these before but I'm not really sure who made them or why. The portraits of the players are really nice and the bottom have contains the players' career stats listed. These won't fit in any standard size frame and I don't think I'll invest in custom frames for these. For now, they'll stay rolled up in the tube they shipped in. 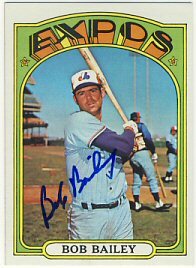 Today I received three cards back signed by Bob Bailey that I sent in to a Chris Potter Sports signing. 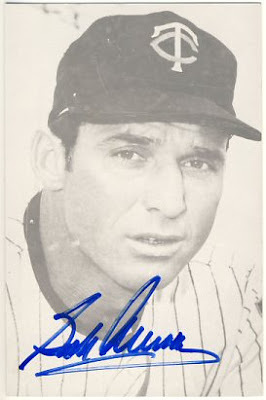 I had him sign a 1965 Topps. 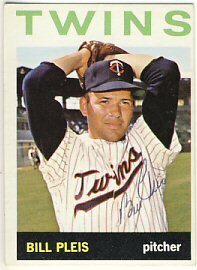 I haven't added many cards to my 1965 set so it's nice to get another added. 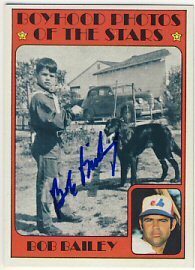 I also had him sign his regular 1972 Topps card as well as his Boyhood Photos card. 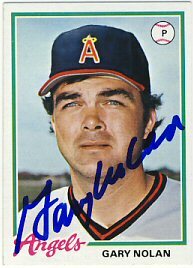 This brings me to 381 signed cards from the 1972 set. 19 short of my goal for the year. 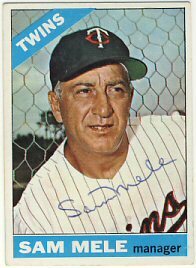 I received one ttm return today as well as a couple of cards I bought from a fellow SCN member. 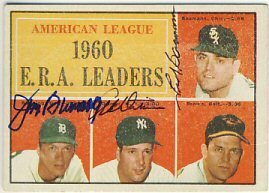 First, Art Ditmar signed a 1961 Topps (1960 ERA Leaders) already signed by Frank Baumann and Jim Bunning. Now it's off to Hal Brown! 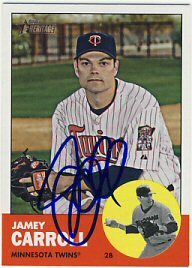 I bought a couple more Twins Heritage cards to try to complete my sets. 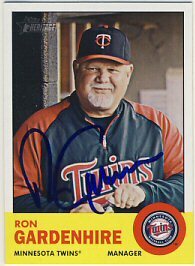 I bought 2012 Topps Heritage cards signed by Gardenhire and Carroll. 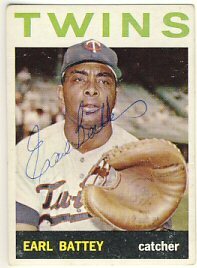 I still need cards from this set by Scott Baker and Alexi Casilla, who are normally really easy autographs to get at TwinsFest or other signings around town. 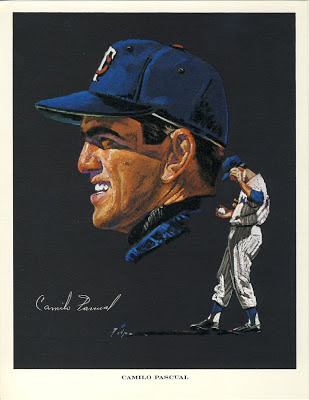 Unfortunately, neither of them are on the team any more so I need to find another way to get them. 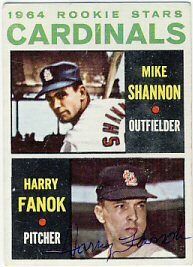 Today I received a 1964 Topps signed by Harry Fanok that I sent out in early August. 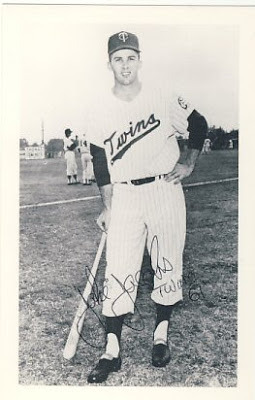 Mike Shannon is pretty hit-or-miss ttm, so I'm not sure I'll send this one on to him. 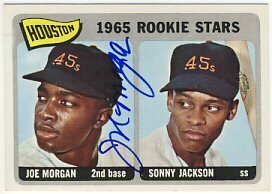 Today I received another "duplicate" card that I sent out. 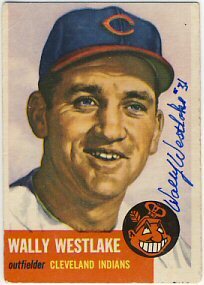 This time it was Wally Westlake on a 1953 Topps. 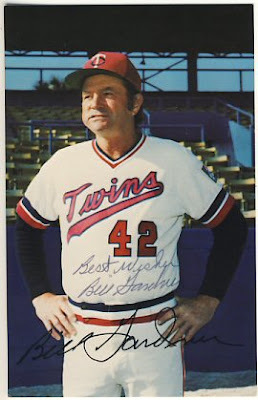 He also included a signed picture personalized to me in which he referred to me as a "primetime dude". Ha! 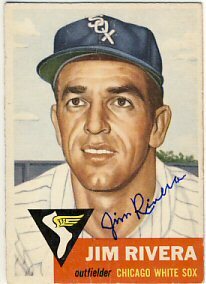 Today I received a 1953 Topps signed by Jim Rivera in about 8 days. 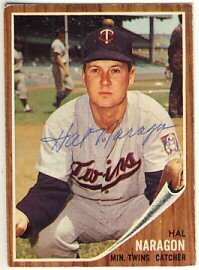 I already had a 1953 Topps signed by him, but this one was just laying around, unsigned. So I sent it again. Does anyone else do this? 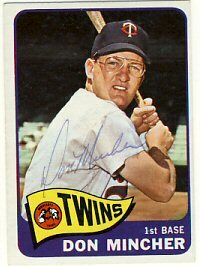 I had a bunch of unsigned cards laying around from the '50's and '60's that I already had signed copies of. I tried selling them but didn't get a decent offer, so I started sending a few of them out. 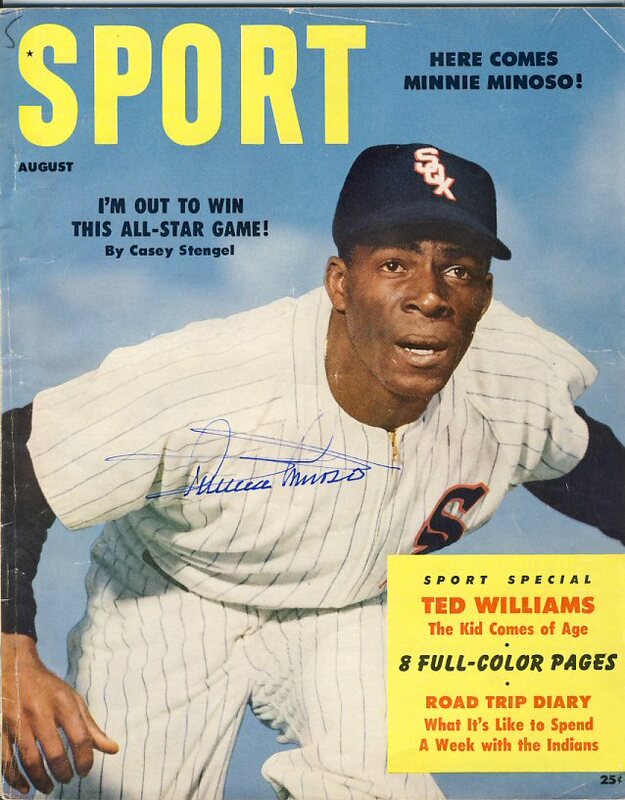 Minnie Minoso signed a 1954 Sport Magazine. I included $15 with my request. 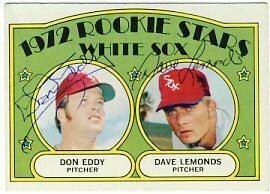 Don Eddy signed his 1972 Topps rookie card. Now it's off to Dave Lemonds to finish it off.